The questions and answers below should help you get started. When you are ready to sign up, or need more info please do not hestitate to call us 24 hours a day at 1-888-563-2591. Can I succeed at selling auto parts online? Annual sales of both OE and Aftermarket parts are measured in the hundreds of billions of dollars in the USA. According to NADA and AAIA ONLINE sales are growing exponentially each year. Every day buyers and sellers like you switch to the web for buying. Can you succeed at selling parts online? Yes. What is a Sophio Webstore? 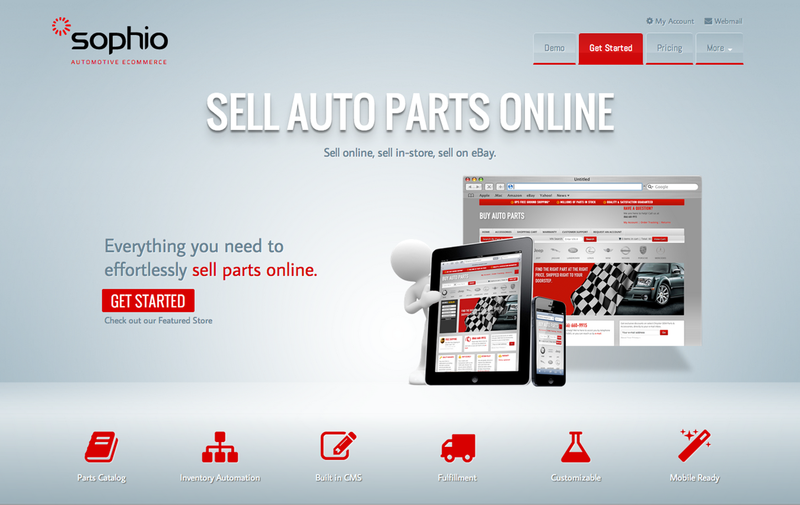 A Sophio Webstore is all that you need to power your online auto parts business. Sophio is an eCommerce framework designed specifically for Auto Parts sellers. Our system is designed to work with our merchants existing warehouse or dealer management system. In fact we are directly integrated with more than three dozen systems and platforms. This is the power of our framework. Nope! Sell all you can and pay only your standard Paypal or payment gateway fee's. We have been selling our solutions to the Automotive community since 1999. Our clients range from multi-billion dollar international automobile manufacturers all the way down to start-up dot-com's and everyone in between. Our pricing is location and site based so you will be surprised to learn how inexpensively you can get up and running. Who's Shopping Cart can I use? Our framework includes a shopping cart, but you can use your own shopping cart or an open source cart if you wish. Doing so may eliminate the most valuable features of our system. We regularly replace the shopping cart and ecommerce system of a clients existing site when they switch to Sophio. What if i have some of my own content, but want to use yours? One of the best features of our system is the ability to sell from multiple catalogs at the same time, with a single shopping cart and one page checkout. you can bring your own content, or build it with our tools. You can use a third party catalog with your own as well. For example you might 'bolt on' an Accessory or Wheel catalog to your replacement parts catalog. The process starts with you, the merchant choosing one of our many Original Equipment, Aftermarket, or Accessory catalogs. We work with many catalog content providers such as WHI Solutions, DCI, and SMTP. Sophio has over ten years and hundreds of thousands of dollars licensing the complex web services from our sources so you don't have to. Next we'll create you a web design or use your existing one and wrap it around our catalog, shopping cart, and checkout system (the Sophio eCommerce system). We'll give you a list of dozens of payment gateways to choose from for credit card processing. We will configure your pricing, taxation, and shipping; and finally we'll train you how to process transactions and deal with customer service inquiries. The final step is for you to point your domain name to our servers and wallah your in business! How do my customers buy parts from my my webstore? All of our catalogs work virtually the same. Buyers can search by part number or sku, vehicle (year make and model), VIN, Keyword, Part Type, Category, and virtually any combination of the above. Pricing can be managed as a markup from cost, a discount from jobber or list, or on a part number by part number basis. Since most of our clients integrate their stores with their existing business management systems (or their supplier systems), pricing can be managed in real time , meaning you create custom pricing models and the system can calculate price. There are lots of ways to for your store to handle shipping. The best way and recommended way is 'real time' integration with UPS, FEDEX, DHL, AND USPS. Your website will use weight and the zip/postal codes to calculate a real time and accurate shipping amount. This amount is controlled by you via the control panel, so if you want to offer free shipping on certain orders (over $75 for example), it is no problem. You can setup one shipper such as UPS or use all four major shipping companies. You can even opt to use a flat rate amount for all orders. In summary, shipping is very flexible. We offer INTERNATIONAL shipping calculations as well and work with folks such as Bongo International. How does B2B work at my webstore? You can allow buyers to register, not pay taxes (if they have a tax id number), and you can offer per customer pricing. No problem! How do orders get processed? 100% business automation. If you use one of the dozens of systems we integrate with, orders with approved payments simply print in your warehouse or parts department as if you entered them into your existing system. If you are a 'pure dot com' your orders can be electronically fulfilled by any of the hundreds of distributors points we connect to. Alternatively, if your website is not integrated with your business management system, we can have the system email you an order which can be forwarded or printed. Can my suppliers retrieve orders somehow even if they are not integrated with you? All orders created by a Sophio web store are stored in B2cCentral.com. It's primary purpose is to make it easy for your warehouse, suppliers, and partners to print packing slips, update order status, etc. Let's say you deal with a small accessory manufacturer who still uses paper catalogs and fax machines. They can be given a link to Sophio Central and once they login they can download packing slips for orders for the parts they sell. You can setup as many accounts for as many suppliers as you want. Do I pay commission or transaction fees on orders? Similar to Amazon, eBay and other major internet service providers you do pay a small transaction fee. The rates range from 0.1 to 2.00 % per sale. The rates are determined by the content provider and or warehouse distributor that helps to power and fulfill your orders. Who manages the look and feel of my site? We offer a content management system in the control panel of your website. If you are a web developer you have direct access to the html, css, and js files. If you are not technical or articistic we are happy to offer professional services starting at $75 per hour. We sure do! You can make money by helping us get more clients. We offer our affiliates $500 for each new client that you refer and successfully builds a Sophio store. Yup - $500! Get started by registering here: https://support.sophio.com/register.php . The configuration of your new store takes one business day. The day you signup, you'll have a link to start learning, playing, and conifugring your store. The design, credit card processing and management system integration can take up to thirty days from the date of signup. Click here to request a demo or get more info.